Prime Minister K P Oli has hit all the right notes in his first two weeks in office, first by forging a UML-Maoist unification deal, inducting some promising faces into his cabinet, and then by trying hard to include Madhesi figures. He chose economist Yuba Raj Khatiwada as Finance Minister, sidelining other senior but inexpert aspirants for the post. Khatiwada’s appointment has been hailed by many as the right move, and a recognition of the fact that the country now faces not a political crisis, but an economic one. Khatiwada is someone who could set right the wrong monetary policies, profligacy and misplaced priorities of the previous NC-led government. Khatiwada is seen by some as having a socialist bent, and is expected to take some drastic actions: restricting credit flow into unproductive sectors, curbing imports, and getting the economy cranked up. Oli promised prosperity, and Khatiwada is the right person to deliver that. The 7-point UML-Maoist deal last week cemented the unity between the country’s two largest communist parties, promising a stable government for five years. Once the two parties register Nepal Communist Party (NCP) at the Election Commission, Maoist Chair Pushpa Kamal Dahal will find it difficult to oust Oli. He needs at least 40% MPs by his side, but around 70% MPs of the unified party will be supporting the government. Oli and Dahal have also inched closer to a deal with Upendra Yadav, the leader of the fourth largest party in the Federal Parliament. After Yadav joins the government, the ruling coalition will have a two-thirds majority which will give Oli the leverage he needs to remove all constitutional hurdles to deliver on his promises of stability, prosperity and good governance. Political analyst Krishna Khanal says the Oli government now cannot fail because there will be no excuse if it does. The NCP could then easily win another election even if it fulfills only 20% of its promises. His prophecy looks realistic because the main opposition NC, does not seem to have realised why it failed, and its leaders are busy blaming each other. But the Oli government might end up promoting crony capitalism, disappointing people once again. Both UML and Maoist leaders have openly hobnobbed with dubious businessmen in the past, and these lobbies have shown signs they are capable of meddling in politics to scuttle economic reforms. 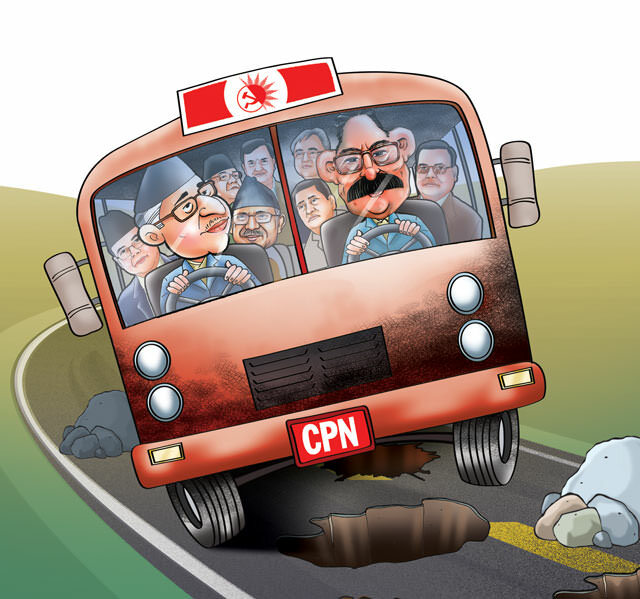 There are too many backseat drivers in the united NCP bus, which will be jointly driven by Oli and Dahal for the next five years. The road itself is potholed and in drastic need of repairs.